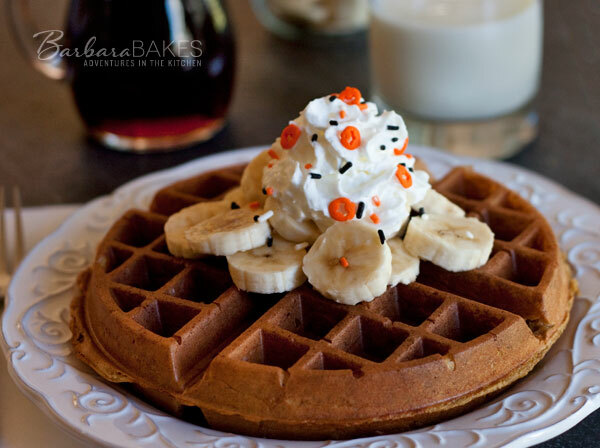 A crisp, pipping hot, whole wheat pumpkin waffle topped with bananas, whipped cream and Halloween sprinkles. A special fall breakfast for someone extra special. 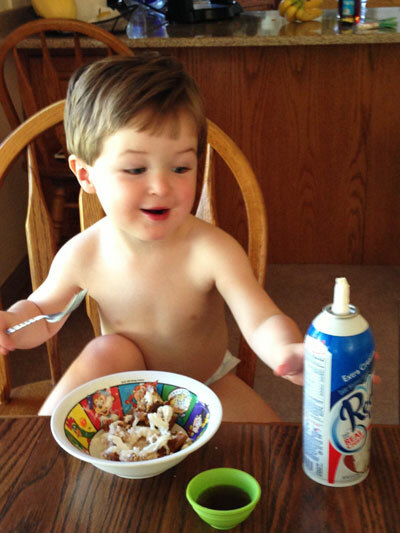 My grandson had a sleep over at grandma’s house Friday night and requested waffles for breakfast the next morning. I had some leftover pumpkin from the Pumpkin Chocolate Chip Bundt Cake, so I decided to combined my favorite waffle recipe, Whole Wheat Yeast Waffles with my Pumpkin Pancake Recipe. 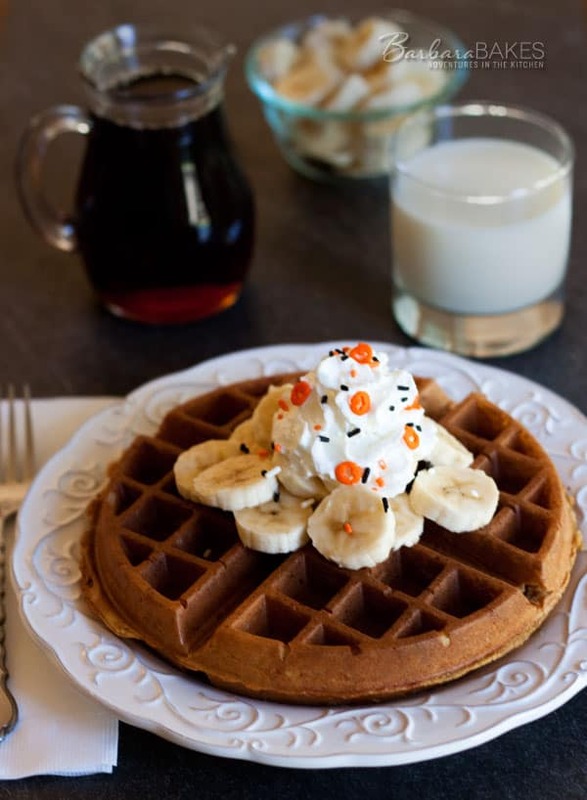 Since I’ve been working on some Halloween cookie recipes and had sprinkles on the counter, I decided it would be fun to top the waffles with a little whipped cream and Halloween sprinkles too. One of the great things about this waffle recipe is you can make the batter the night before, so it’s ready to use in the morning. Yeasted waffles bake up a little bit more crisp than traditional waffles, which is especially nice because pumpkin can make waffles a little softer than traditional waffles. The batter bubbles up and grows in the fridge overnight, so be sure you put it in very large bowl so you don’t wake up to a mess in your fridge. I forgot to make the batter the night before and this bowl probably wouldn’t have been big enough if left much longer than two hours. The pumpkin flavor and spices add a subtle warm fall flavor to the waffles, but the smell of cinnamon and pumpkin pie spices while the waffles are baking is intoxicating. 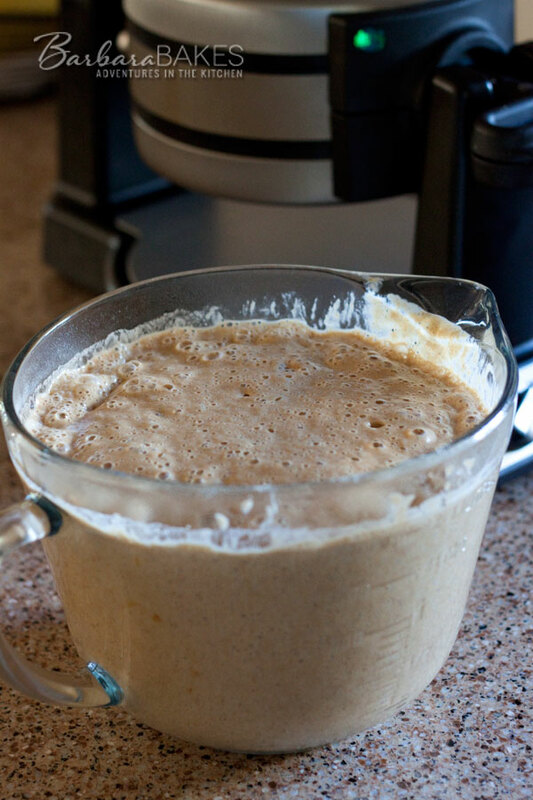 In large mixing bowl, combine flour, yeast, cinnamon, pumpkin pie spice, and salt. In medium saucepan or large microwave safe bowl, combine oil, brown sugar and milk. Heat to 120° to 130°. Add heated liquid ingredients to dry ingredients and blend on low speed until combine. Add eggs, vanilla, and pumpkin. Beat 2 to 3 minutes on medium speed.